As a registered 501c3, WECO finds charitable organizations around the world with programs for women and girls. We first vet ones we think will be viable partners for us, and then undertake a process of discovering a project we can collaborate on that will increase their existing impact. Once we decide on one, we prepare to fundraise for it. We appeal to corporate sponsors, private investors, donors, friends, and family, and we recruit a group of volunteers to personally fundraise for every project with us. While funds are being raised, we craft a unique journey for our volunteer group where they work on a leg of the project and participate in responsible travel afterwards. Our work is something that for us came to us for both personal and political reasons. Globally, women remain underrepresented and marginalized. WECO is predominately addressing issues of gender inequality abroad, but as a woman-led organization, we understand the nuances of translating our values and competencies into a gender-biased world. It can present a variety of challenges – some expected, some unforeseen. We also know there is much for us to be thankful for, as Americans. We have a level of choice and opportunity that many women in other areas of the world do not. In terms of gender equality, there is plenty of room for improvement – for our country and for others. As an organization, how we hope to do our part is by bridging the resource gap for women and girls in lower-income countries. 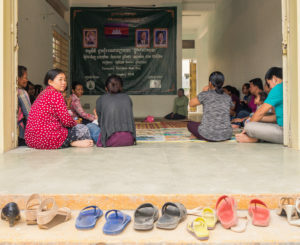 Our two partners in Cambodia (the WRC and the PLF) provide services for women and girls who experience issues from gender-based abuse, lack of education or support services, and systemic disempowerment. 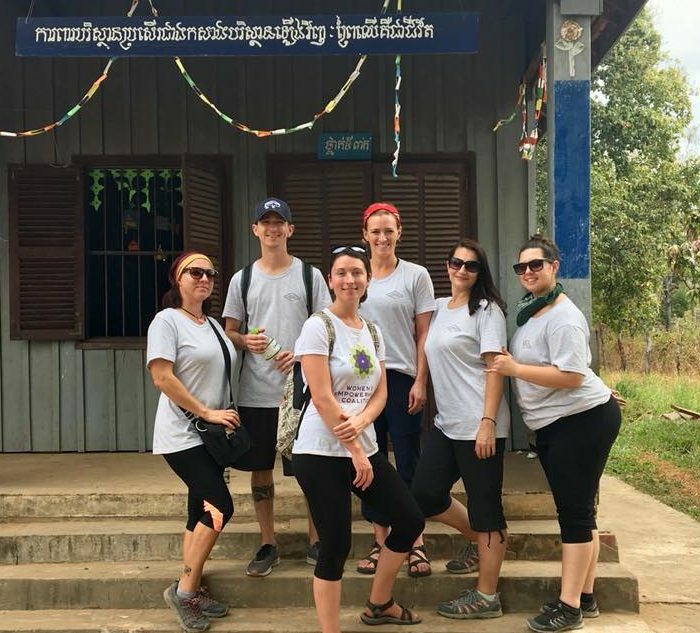 This past January we took a team of volunteers to work on part of the construction project we fundraised for ($20,000 for a child care center) in Siem Reap. As part of our time there, we were able to participate in some of our partner organization’s critical outreach programs. We interviewed several community members and also sat down with the staff to learn more about their perspectives. To us, this is all an important model of global women’s empowerment. We want to learn from other women who work hard towards gender equality in their communities, and we want to support their work however we can. The WRC staff unanimously said the reason they do community work is because they want to empower families and create more equal spaces for women and girls. Each woman told us how they came from similar situations as their beneficiaries, and had experienced the same problems in their own pasts: the effects of alcoholism, domestic violence and abuse, lack of access to education, poverty, and unequal division of household labor and/or child care (always unpaid and under-appreciated). We talked about how they work to change those things in their communities, through education, through creating a safe and friendly place for women to express their need, and to receive support to empower their own lives. 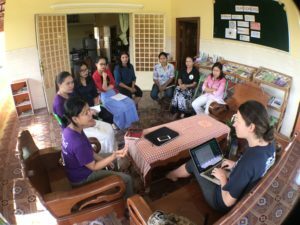 One of the co-founders shared with us her vision for women’s empowerment in Cambodia as ultimately the power to choose, to decide things that are relevant to her life, her health, and her dreams. The practical next steps to achieving this (we believe globally) will be working with men in communities, increasing women’s access to education and jobs, and giving women more power through information, support, and positions of leadership. The issue of sustainability is always a concern for this field and for our work. When people ask us about our sustainability plan for projects, our answer is to point to the work our partners are doing and have done. It is essential to us that our involvement in the projects we collaborate on is not mandatory or long-term (beyond our agreed upon duration and fundraising). This points to a critical part of our work as a development organization: it’s better if we as a Western organization aren’t running the majority of the project work. We choose organizations that have had a history of impact on their communities; they are the experts of their communities, not us. They know what they’re doing, what their communities need, and our primary value add for them is our ability to connect them to resources beyond what they’re currently able to achieve by themselves. This means we mutually design programs that our partners have the ability to run and manage long-term without us. Our objectives with project work are relatively straight-forward: 1) we serve women and girls globally, not only in one area; 2) our volunteer project trips are authentic and custom-made according to each group; and 3) we serve local organizations who are imbedded in their communities. This last point is especially important. We know short of us moving to Cambodia, there’s really only so much we’re good for per project and per location. The organizations doing good work in lower-income countries already exist, and what we can do is channel resources to them through responsible volunteer experiences. The good intentions we carry with us drive our work with WECO, along with activism, joy, commitment, and an unswerving desire to make a difference. A primary goal we have of working with underserved women is to listen and respond to their words about their needs. We work with organizations that genuinely seek to empower people through a process as opposed to a one-time result or outcome-driven project. This is one major reason why we focus on qualitative reporting and storytelling as opposed to using quantitative data as the sole measure of how successful we are as an organization. On the surface, quantitative data presents a succinct story of impact; and when done well it can provide compelling evidence of an organization’s work. At its worst, quantitative data oversimplifies and overgeneralizes complex realities that nonprofit communities face, and under-represents an organization’s actual value. Too often the process of monitoring and evaluating distracts from a nonprofit’s essential operations and burdens already overloaded staff. A hyper-focus on numbers and statistics, we believe threatens to dissolve the very heart of philanthropy, which isn’t logical or rational; it’s emotional and intuitive. It’s a legacy of our shared humanity that is based on relationships built over time, not on buzzwords or numbers. Essentially we try and create levels of connection for participating in global development so that people back home can unfold their own process of discovering the power of generosity, community, and social change – to encourage people to look outside of “me” and into “us.” We want to capture snapshot of how powerful giving back can be. We know the fulfillment that comes from working to spread opportunities to others (opportunities we often take for granted); and we also know it takes courage and consistent improvement to do so in a complex world such as ours – and a complex field such as international development.